Betta fish, also known as Siamese fighting fish, are an incredibly attractive and popular fish, which almost everyone has seen living in tiny cups at the pet store. But contrary to popular belief, they don’t enjoy living in these small glasses of water. The only way they can even survive these cramped conditions is by being regularly dosed with a cocktail of powerful medications. So, obviously they need to be kept in something larger than a cup, but how large an aquarium do they need? Before choosing an aquarium for your betta fish, you need to take a few things into consideration. The first thing that you need to know, and perhaps the most important thing, is that betta fish are not friendly towards other fish. In fact, they make poor tankmates with almost every fish available in the hobby, and will usually either attack any smaller fish they are kept with, or will be bullied by larger, more aggressive fish (and even small fish may nip at their long, flowing fins). And you can’t keep them with other betta fish either. While some people have had some success setting up female betta fish ‘harem’ tanks, where a large group of females are kept together to disperse the aggression, most of the time keeping betta fish together is a recipe for disaster. The fact that it’s best to keep a betta fish alone in an aquarium, combined with the fact that they can breathe air through their labyrinth organ, means that they don’t need an overly large aquarium, and anything larger than 5 gallons (19 liters) is probably wasted on a betta fish. But with that being said, you also don’t want to go too small, because any aquarium smaller than 3 gallons (11 liters) becomes increasingly difficult to maintain. While it is still possible to keep a betta fish happy in a small aquarium, you really need to be on top of weekly water changes, and constantly monitor the water conditions. If you want to learn more about betta fish care, you should read the Aquarium Tidings article, How to Care for a Betta fish. Also, if you’re new to fish keeping, you should read The Complete Guide to Cycling An Aquarium. 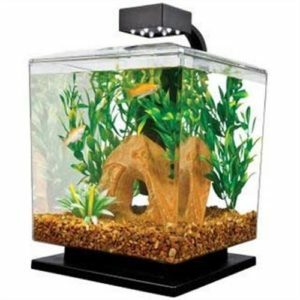 But if you’re ready to choose a fish tank for a betta fish, I’ve picked out five excellent tanks for betta fish, and you can find them all on Amazon if you’re interested in purchasing one. 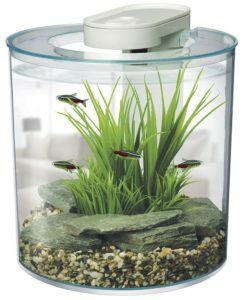 Tetra makes incredibly attractive aquariums, and while 1.5 gallons (5 liters) is on the small side for a betta fish, it can still comfortably house one of these fish as long as it’s properly maintained. 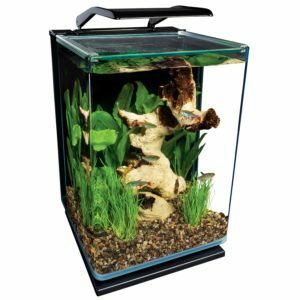 This aquarium’s sleek design and low price makes it’s an excellent starting fish tank for someone just getting into keeping betta fish. It comes with most of the accessories that you need to keep your betta healthy, and includes an internal filter, an LED light and a lid for the aquarium. However, it doesn’t come with a heater, and since bettas are a tropical fish, a heater is always recommended. Marina is known for its excellent quality aquarium merchandise, and this 2.65 gallon (10 liter) fish tank maintains that high standard. 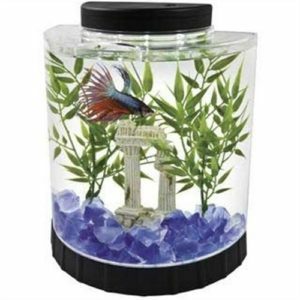 While it’s still on the small side for a betta fish, it makes up for it with a sleek design and an affordable price. While it is made out of plastic, Marina is able to mimic real glass by tinting the edges of the aquarium, which results in a tank that doesn’t look nearly as cheap as some other plastic aquariums do. It comes with an internal filter, a tank lid, and an LED light. But like the other tanks on this list, it doesn’t come with a heater, which is really a requirement for a healthy betta fish. This is a beautifully designed aquarium, and it looks great in almost any setting. However, 3 gallons (11 liters) still isn’t the optimal size for a betta fish, but it will provide it with plenty of space for swimming – something a healthy betta fish absolutely requires. While it won’t be as suitable as a 5 gallon (19 liter) tank, at 3 gallons an aquarium’s water parameters are usually pretty stable. And that means less time needs to be spent maintaining the water. This aquarium comes with an LED light, a Tetra filter, and a flat lid with an opening to feed the fish through. However, it doesn’t come with a heater, so it’s a very good idea to buy one for your betta – since they are a tropical fish and need warm temperatures. The only downside to this aquarium is that it comes with a tetra filter, which are known to be slightly louder on average than other filters. While there’s no rush, it might be a good idea to upgrade the filter at some point down the road if you buy this aquarium. This is by no means the most attractive aquarium on the list, and it looks positively plain in comparison to some of the others. But this comes with just about everything you need (except for a heater) to get started with keeping a betta fish. This 5 gallon (19 liter) tank is large enough that a betta fish will likely survive any non-catastrophic mistakes you make, and the water parameters will be very stable in an aquarium this size – especially if it only contains one betta fish. 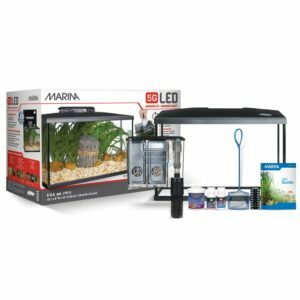 It comes with a filter, an LED light built into the canopy, a small net, fish food (which isn’t really suitable for a betta fish), Aqua Plus Water Conditioner, Cycle Biological Supplement, and an aquarium guide. 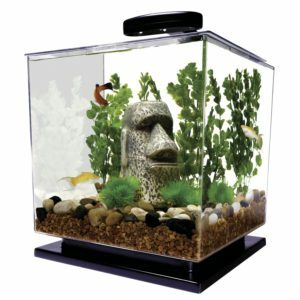 These accessories, combined with its very affordable price, makes it one of the best aquariums you can purchase for a betta fish. This elegantly designed aquarium is the perfect size for a betta fish. The only possible downside to this aquarium is the built-in filter, which can be a pain to replace if it breaks or you want something a little bit more powerful. As I already stated, it comes with a built-in filter, and it also includes an LED light with two settings – daylight and moonlight – and a sliding canopy for access to the tank. And in what has become a pattern in all of these small tanks, it doesn’t include a heater – something that is absolutely required for any tropical fish. I actually keep one of these in my home office, and it looks amazing. It’s a nice change from the other monster aquariums that dot my house, and like everything Marineland makes, it’s incredibly rugged and operates with very few issues. Why do you label these aquariums as “EXCELLENT” if none of them come with a heater which you say is needed? Why not, instead of wasting OUR TIME, tell us about aquariums that ARE beneficial to Beta’s that DO include a heater? I would, except they virtually don’t exist. The fact of the mater is, very few aquariums come with everything you need. I don’t know why you see it as such a personal affront that you need to buy a heater. Hi, great website!! I just upgraded my male betta tank to a 35 ltr planted tank, my betta seems to love it and its quite a nicely designed tank. Its a Milo 45 R Vision aquarium that comes in white or black to suit various rooms so aesthetically its quite pleasing especially with the curved front. It has a detachable filtration system so you can replace it with time but its working extremely well so far and I use sponges and ceramics to filter the water, it also comes with a detachable heater, although any store bought 50 watt heater would fit in the compartment (probably). The lighting is also included but is also detachable and completely safe due to a cover, its LED and is really good for easy plants not to mention that one can add to the power of the lighting by changing the led to something better. So as a beginner tank its more than excellent and it has all the potential to go to a small full on aquascaped tank in my opinion. It sounds like your betta has quite the nice home there, Celine. I’ll definitely take a look at that tank and may add it to the list.